ah… the daily hiel strikes again! Wasn’t it this very same Mail that objected to the granting of refugee status to ‘filthy’ (sic) Jewish people fleeing from 1930s Germany? Since then, they seem to have simply recycled the same xenophobic loathing over any refugees or asylum seekers (always bogus, of course). Never mind: they can spill some extra ink on state entitlement claimants, victims of the recession. 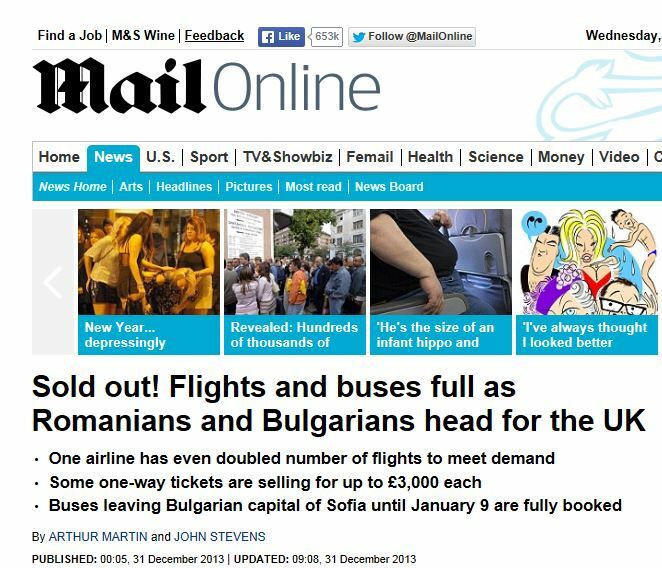 Immigration from Romania is something of a hot topic in Bristol. According to an item on BBC Points West, there are now so many Romanians in Bristol that the Romanian government has appointed a special ambassador to the city. The programme interviewed the gentleman in question at his business. I’ve got a feeling he was a restauranteur, but I could be wrong. Despite the fears of a flood of immigrants from that part of the Balkans, I’ve heard of absolutely no problems coming from recent Romanian immigrants in the city. I also think that Britain is culturally well-placed to deal and develops links with the country. Romanian is a Latin language, like French, Italian and Spanish. While it’s very definitely an eastern European, Balkan country until the 19th century the language was written in the Cyrillic alphabet, used by the Russians, Bulgarians and other Slavonic peoples – it’s people see themselves as more orientated towards the West. This should be a point of positive contact, and hopefully development, for the British and Romanian people. 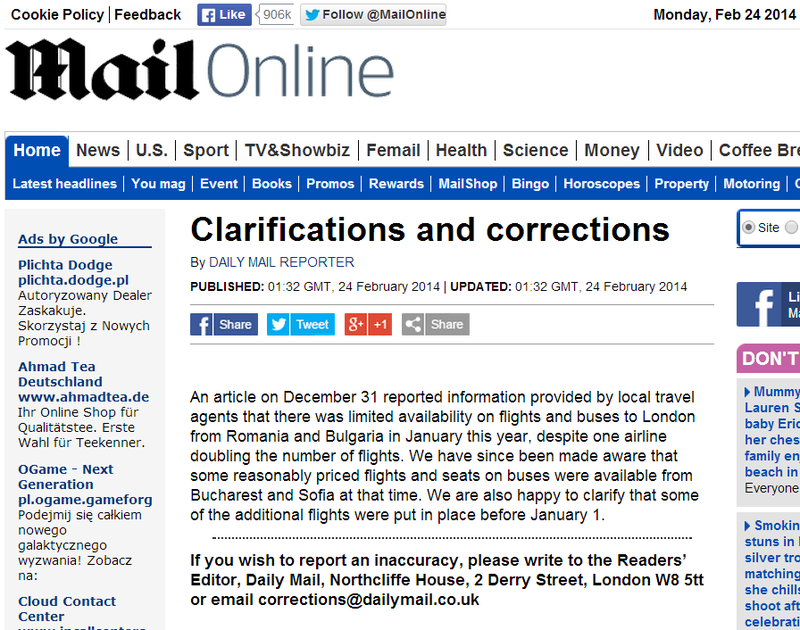 Imagine; incorrect scare mongering from the Daily Mail! Well spotted!!! Not that any mail reader gives a damn. I personally don’t give a toss how much money smug Middle Class types make out of so called English Language courses I still do not want Britain to allow these people to come here! This constant chorus of support for immigration from those who already have plenty of money and are prepared to condemn their own countrymen to lifelong penury fills me with an urge to throw up! To certain groups immigration means extra students,cheap plumbers,cheap nannies ,cheap cleaners,cheap fruit pickers,cheap care assistants and higher rents for the rat holes they own as Landlords. To people such as myself it means ever lower pay,unemployment,an inability to live a decent life and a neighbourhood that becomes ever more like a back alley in Bombay! Do people in my position have to gut our “betters” like herrings before you will take our complaints seriously? Many card carrying Lefty types like to believe that they would rather die than abandon the values that have allowed them to create present day Britain.Well they might not have any choice about dying because very soon millions of British people,not just those who happen to have a British Passport, will be left with NOTHING to live on,and a person who has nothing has nothing to lose! If history teaches us anything it is that the RICH never,ever, learn. They always believe the poor will simply keep taking whatever crap the Rich think they can get away with! Eijnar – it’s not “smug middle class types” earning the money from foreign language learning – it’s our country the UK. If you care about the UK you should care about its important industries.